The Gorgeous Skin 30-day plan includes a detailed daily menu, which is awesome...if you like that kind of thing. 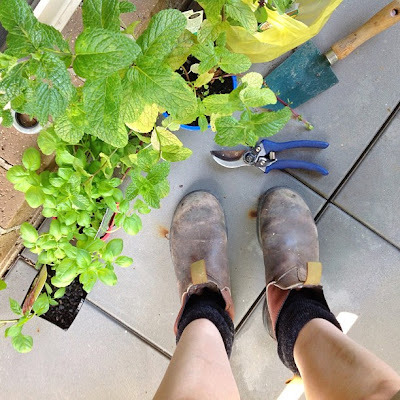 Me, I start following a set plan and fairly quickly find myself feeling constrained and restricted - no matter how amazing the food might be. And those feelings spiral into thoughts of "I can't have..." and "It's not fair..." and we all know where that leads, right? Off-plan eating, sneaky little bites of this and that (which I manage to kid myself don't count) and a rapid road to chucking in the towel. So I'm doing my own thing and just following the principles of the plan, with selected recipes from the book that take my fancy. 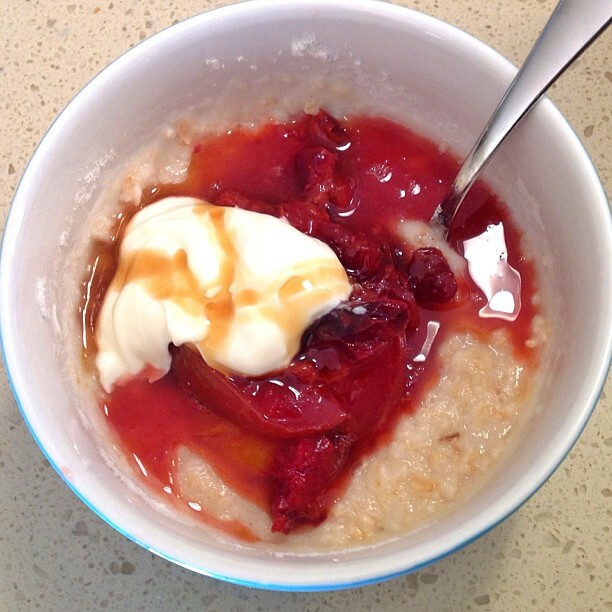 This morning's brekky of choice was good old porridge, served up with some of my home-made fruit compote (ingredients: seasonal fruit, vanilla, cinnamon and nutmeg), a blob of Greek yoghurt and a drizzle of pure maple syrup. Basically, the nutrition plan is packed with fresh veggies, fruit, lean protein (mainly chicken and fish), good fats and small serves of the more nutritious starchy carbs, usually only once a day. There's a huge emphasis on fat consumption - from fish, nuts, seeds and omega-3 supplements. I like this part. :) I know how crappy my skin goes on a low-fat diet. The plan allows for three main meals plus up to three snacks daily. Big tick from me on that one too. A minimum of eight glasses of water daily are prescribed, with herbal or green tea as well. Yep, all good. In fact, there isn't really anything I dislike about the food side of things. Exercise is part of the deal too (yay!) and while the book doesn't specify an exercise program as such, it does recommend resistance training and cardio on alternate days, with a rest day once a week. I'm good with that as general advice, but once again, I'm doing my own thang. Today's exercise included a gimpy weights session at the gym, some moderately strenuous gardening and endlessly climbing up and down a stepladder, slapping a final coat of sealer on our monster set of bifold doors. I thought finding a wheat-free bread would be a piece of cake bread, but I was wrong, wrong, WRONG. Our local supermarkets stock a wide range of rye breads, but every single one contains massive amounts of wheat flour too. I know, because I spent ages in the bread aisle, peering at every damn label on every damn package. I briefly thought about buying a gluten-free loaf, but they're all like bricks. Nuh-uh, I'm not settling for that rubbish. So the quest is on for the perfect loaf. Ideally, I want a sourdough rye that has no freaking wheat in it...but I'm exploring other options. 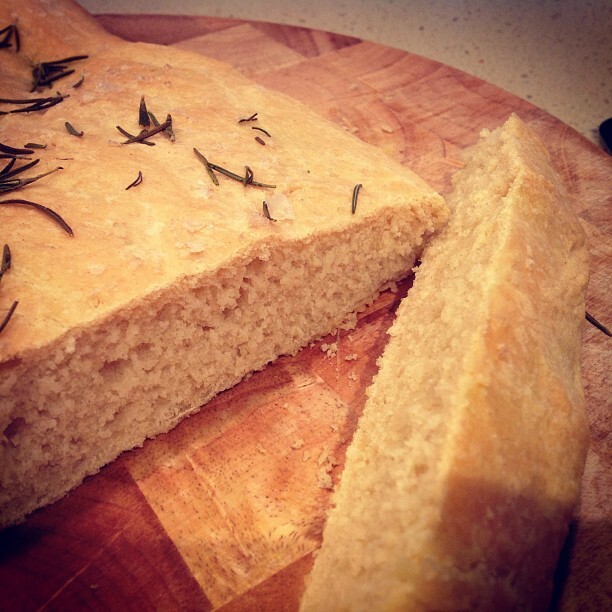 The lovely Michelle Koen of Healthy Helpings fame came to my rescue yesterday with an easy recipe for spelt focaccia. Spelt focaccia with sea salt & rosemary. Awesome! The search continues for a sourdough rye loaf though. Does anyone out there have a fabulous recipe that's free of the dreaded wheat? Spelt does contain gluten though, so at least this will determine if it's the gluten or something else in wheat that upsets you. I'm on the case with the rye sourdough. I need to get a starter, or make one. Making one with natural bacteria from the air and the rye takes about 10-14 days and apparently you just keep it going and it improves over time. Gorgeous Skin - let's go!